Baltimore, Md. – The winners of the Pressure Ulcer Prevention Mobile App Challenge, a contest to create the first mobile health app that encourages the use of information exchange standards, were announced at the opening day of the University of Maryland School of Nursing’s Summer Institute in Nursing Informatics (SINI) on Wednesday, July 17. The annual three-day conference, now in its 23rd year, drew more than 300 nurse informaticians and health IT professionals. MobileHealthWare captured first prize in the App Challenge for its WoundMap PUMP (Pressure Ulcer Management Program), an iPhone application that allows the user to evaluate a patient’s wound and track changes over time. 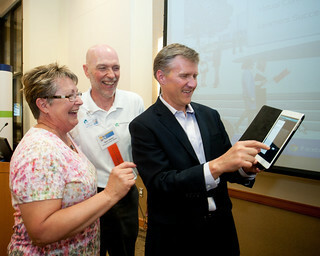 Tom Richards, CEO of MobileHealthWare of Sheridan, Wyo., and Karen Zulkowski, DNS, RN, CWS, associate professor at Montana State University-Bozeman, accepted the award and demonstrated the app, which can be viewed at MobileHealthWare.com. The Office of the National Coordinator (ONC) for Health IT, in collaboration with the Department of Veterans Affairs, Kaiser Permanente, and the American Nurses Association, sponsored this competition, which is the first ONC-sponsored challenge aimed specifically at nursing. Entries needed to demonstrate the value of common models and terminologies and promote the continued integration of nursing content into SNOMED Clinical Terms (the most comprehensive, multilingual clinical health care terminology in the world). According to the Agency for Healthcare Research and Quality, more than 2.5 million people in the United States are affected annually by skin breakdowns that cause pain, increased risk for serious infection, and increased health care utilization. A mobile health app would support nurses in partnership with patients, families, caregivers, and the multidisciplinary health care team, to reduce the incidence and severity of pressure ulcers. The second- and third-place Challenge finishers were the Dermtap Team led by Michelle Longmire, MD, of Palo Alto, Calif.; and Wound Mender by Doug Brown of Morgantown, W.Va., respectively. For information, on MobileHealthWare, email Richards at trichards0445@me.com; onDermtap, team leader Michelle Longmire, MD, at michelle@dermtap.com; or on Wound Mender,Doug Brown, founder of IOSTREAM, at iostreaming@gmail.com.